$775.00 M 1936 steel helmet, dated 1937. Nicely marked with original manufacturer's stamps and date. A great example with 2nd pattern replacement liner and original paint with clearly visible red star. About Russian size 58 (US 7¼). $870.00 "Leningrad" Steel Helmet, 1942-43. One of the few ersatz models produced in Leningrad for the needs of its garrison and civil defense forces during the siege, while the city was almost completely cut-off from outside supplies. This very interesting and uncommon piece resembles an M36 helmet but features simplified construction and is made of cheaper materials. In very good to excellent condition, apparently never worn. $875.00 M 1940 steel helmet (SSh-40), dated 1943. In very good to excellent condition, a nicely marked example by the Lysvenskiy Metal Factory. Comes complete with original liner pads and chinstrap. $850.00 M 1940 steel helmet (SSh-40), dated 1944. A very nice "textbook" example of a mid-war Soviet helmet, nicely marked and dated. Comes with well-preserved original coat of paint, complete original liner and original chinstrap. $90.00 M 1940 steel helmet (SSh-40), dated 1950. A nicely marked early post-WW2 / Korean War era example in very good condition. Comes complete with original liner and chinstrap. $395.00 Red Army Enlisted Man or NCO pilotka side cap in wool gabardine, early 1940s. A very scarce early WW2 model without sweat band, nicely marked. Size 55 (Small). In good overall condition. $50.00 Army enlisted man side cap, dated 1964. In olive drab "salt and pepper" cotton virtually indistinguishable from the fabric used in WW2. Size 53 (small). Excellent unissued condition. $35.00 Army enlisted man Pilotka Side Cap, in olive drab COTTON, 1970s - mid 80s, size 60. Nicely marked and in excellent unissued condition, shows storage age only. $8.00 Army Pilotka side cap for Enlisted Man or NCO, 1970s - early 80s. Size 57 (US 7 1/8). In excellent unissued condition; comes complete with a hat badge. $29.00 Navy officer side cap, dated 1988. Size 54 (small). Excellent condition. $17.00 Late Soviet Army "Panama" Cap, 1991 dated. Replacement tropical cap for the Afghanka. $8.00 Army field cap in olive drab cotton material, dated 1990. This model was widely used by Soviet servicemen in Afghanistan. Size 53 . In mint unissued condition. $140.00 Beskozyrka "Donald Duck" cap of a Naval Border Guard sailor, dated 1958. Attractive early piece with characteristically small crown, essentially WW2 style. Size 54 (US 6 3/4.) In excellent condition. $50.00 Navy sailor "Donald Duck" cap, summer model, dated 1977. Features unusual "Navy" cap tally worn by sailors on honor guard detail, enlisted personnel of central naval HQs, or members of other special naval units. Size 58 (about US 7 1/4). In very good condition. $55.00 "Donald Duck" Beskozyrka cap for a Baltic Fleet sailor, summer model, dated 1984. Nicely marked by a factory in Leningrad. Extra Large size 60 (about US 7 ½). Excellent condition. $45.00 Navy sailor Beskozyrka "Donald Duck" cap, dated 1987. By an uncommon maker, a factory in the Pacific port city of Vladivostok, and features unusual generic "Navy" cap tally. Small size 55 (about US 6 ¾ ). In very good to excellent condition. $15.00 Kirov Higher Naval Academy cap tally. $25.00 Northern Fleet Cap Tally for a sailor's "Donald Duck" Beskozyrka cap. This scarce model was used before the honorific title of "Order of the Red Banner" was added to the name of the fleet in 1965. In excellent condition. $125.00 Paratrooper Hemet, dated 1953. 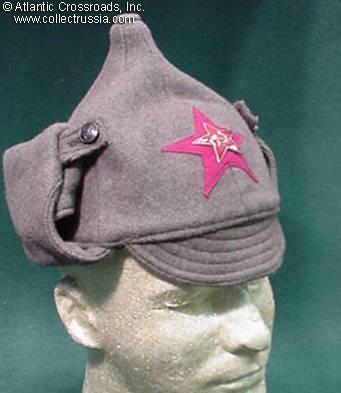 The first post-war model of the Airborne Spetznaz jump helmet in excellent unissued condition. Size 57. $40.00 Airborne Spetznaz soft helmet, winter type, dated 1988. Excellent unissued condition, size 58. $99.00 M 1972 Naval Infantry beret, dated 1980. A very scarce early example in excellent condition. Size 56 (small). $34.00 Summer weight camouflage beret in KLMK "computer pattern", design dates to late 1970s - mid 1980s. Elasticized -- one size fits between 56 and 58. Manufactured 1990. $850.00 Fireman's Steel Helmetfeaturing a front plate with the insignia and motto of the Soviet Fire Department, circa 1920s-30s, size 56-57. $275.00 Motorcycle Police helmet, circa early 1980s. An early model featuring straight lower edge of the Plexiglas visor and smaller knobs on the sides. Standard type used by the Soviet GAI Highway Patrol Motorcycle Police. Approx. size 58, in unissued near mint condition.